Anyone up for a "test kitchen" challenge? The victim. A liqueur version capturing the flavours of baklava. This is a recipe I’m about to make, so I can’t vouch for it’s virtues. It is untried and untested. Anyone out there brave enough to try making it with me? Let me know if you do. I’ve been thinking about the possibility of making baklava liqueur for some time now. It seems simple enough on the surface. 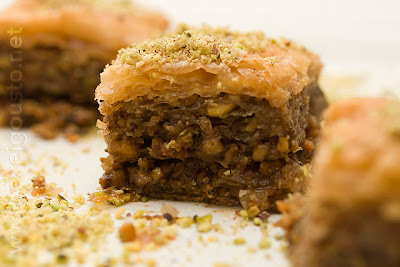 Baklava, that amazing Greek phyllo dessert, has very distinct and delicious flavours. Walnuts, honey, pistachios and cinnamon being the most pronounced. It is often sprinkled with pistachios, but not also so. Taking my start from baked baklava ingredients I’ve come up with the following recipe. I’ll post later with an update about my results. Feel free to come back with your comments if you try this with me. I’ll be starting mine tonight, without the pistachios. Place the walnut pieces (and pistachios if using) in a frying pan and gently toast until they become fragrant. Do not burn. Remove from the heat and let cool. Place in a container and refrigerate for 1-2 weeks. Agitate periodically. Combine the resulting liquid with the vodka and let age for at least 1 week before serving. This sounds right to me. I would love to have a worldwide test kitchen on this. Anyone up to the challenge? If we pull this off, it should be quite a taste!